An attractive way to decorate a bottle or jar is by painting it. This is a guide about glass painting craft project ideas. If you are like me and have an endless supply of half used paint containers, some glass jars, and are looking to make something unique to add to your home decor, try out this simple and inexpensive idea. 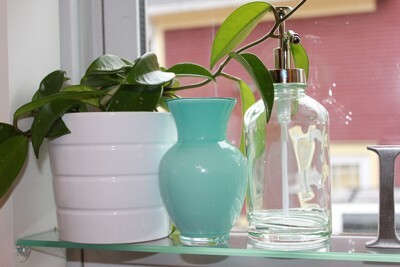 You can either use glass containers you have (Snapple bottles, vases) or hit the Dollar Store or Goodwill to find jars/vases to your liking. 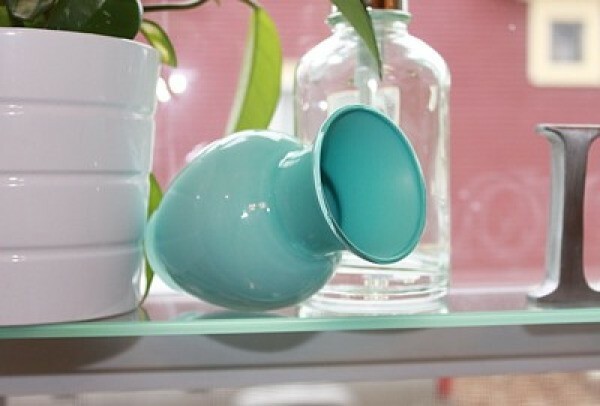 Pour a little bit of paint into the glass jar, bottle, or vase and slowly twist and turn the bottle so that the paint will start to swirl from the bottom of the container to the top of the container, painting the inside of the jar. You don't need much paint, it all depends on the size of your glass container. Don't worry if you use too much paint. If you end up with excess, just pour the extra paint back into the paint container. You can either put flowers in the container or just use it for decoration. Either way, it's an interesting transformation with unlimited possibilities. The total cost of my project could be as little as -0-, but in my case was 49 cents (thanks to Goodwill). The only thing more romantic than candlelight is candlelight softened by the faint glimmer of enameled glass. 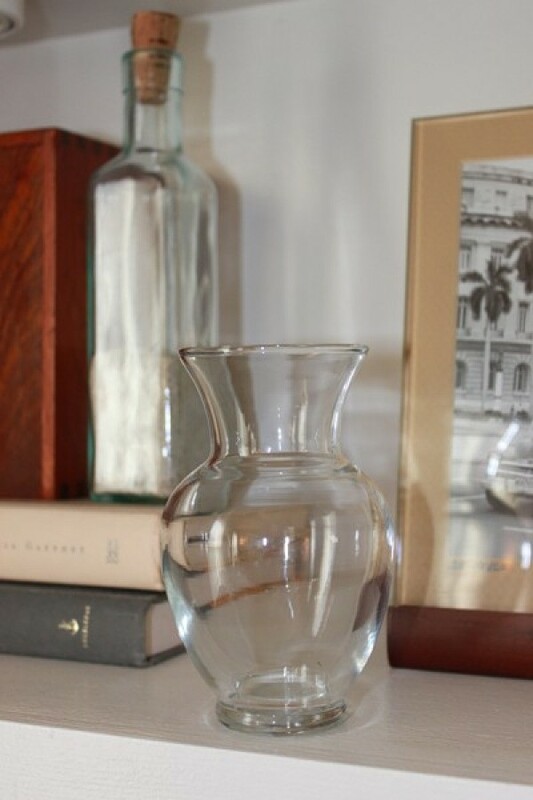 This beautiful votive candleholder started life as a yard sale cut glass goblet. A couple of coats of shimmering and glittered nail enamel transformed it into romantic fantasy in soft pearly silver and shimmering turquoise. If you can paint your nails, you can duplicate this faux stained glass candle holder. I raided my daughter's nail polish collection for this project. Nail enamels are made to cling to smooth surfaces - like your nails, or crystal. They're ideal for painting on glass. If you add a coat of nail hardener as your finish, the design will withstand washing in anything but the hottest dishwasher cycle. Wash glass with dish detergent to remove any oil or grease. Using Electric Blue Nail Slicks, carefully paint the cut glass channels up the sides of the glass. Allow to dry completely. Add second coat. Allow to dry. Apply three coats of glitter green to glass between channels, bringing color lightly just above tips of channels. Allow each coat to dry completely. Apply one coat of pale green shimmer nail polish over glitter green, extending the color about an inch above darker green. Starting at top of glass and brushing downward into pale green, apply three coats of Moonlight Frost, allowing each coat to dry completely. Apply two coats of top coat to entire glass, allowing each to dry completely. Allow glass to dry overnight before lighting candle inside it. 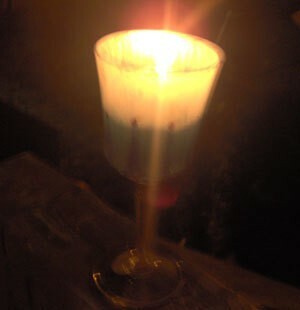 The glass is the perfect size to hold a votive candle. Other glasses that are just right for holding votives include shot glasses and rocks glasses. Painting on glass takes a little practice. At first your results will be streaky and have brushstrokes. Once you get a feel for how much enamel to use and how to flow it on rather than spreading it, you'll be able to create almost anything with nail enamels on glass. 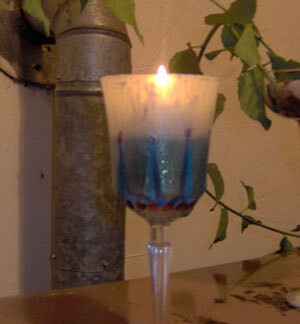 Shimmer nail slicks and glitter colors work best for candle holders. Their natural translucence softens the candlelight to a warm, romantic glow. Once you get the hang of painting on glass, you might try your hand at delicate flowers on chunky whiskey tumblers, or butterflies decorating a champagne flute. With the variety of colors nearly endless, you can let your creativity have free reign. 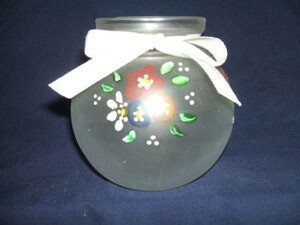 You don't have to be an artist to create beautiful hand-painted candle holders from inexpensive glass containers. I need glass vase painting tips and templates. First, use glass paint from craft store. Michael's always has 40% coupons & I evenutally got the colors I needed. This works on glass that needs to be washed. It cleans up like acrylics, doen't ruin your brushes. It's been a few years since I made stencils, but I think I got the "transparent" soft plastic sticky backed sheeting from Michael's. It's made by Kittrich and I think it's called "Magic Cover". If you have a photo of what you want to paint, you put this plastic over it & draw your design to be cut out with a craft knife. I made 3 sizes of lady bugs that were from small stickers & I went to Office Depot & had them enlarged from 1/2 inch to 4 inches. Put the plastic over, drew, cut & then stuck this sticky backed stencil to glass pots, did same with hearts on wine glasses. Best stuff for a curved surface. Thank you for the feedback. I have a problem with the paint running and peeling off when I remove the sticky stencil. Any ideas on this one? If you have pictures from magazines or from the internet that are not very complicated, you can tape them to the inside of the vase instead of using stencils or templates. You can even draw the outline of flowers and vines on paper and tape that to the inside of the vase, use a fine paint brush to paint the outline then fill in and shade as desired. I am wanting to paint glass ornaments and need to know where to start? What kind of paint is best to use? Do I need to put some type of finish to seal the paint? I will take any suggestions or guidance. Is there a web site I can visit? Help,I have to paint a 100 glasses with the peace sign on wine glovets, I tried putting the design inside the glass, drawing it over the glass,and tried to make sticky stencils, I´m getting frustrated the client wants them perfect even, on colors that does not come out in the dishwasher or microwave, the bad part is I can´t get them even, because with the stencil I made. It can´t get perfectly attached to the glass ,too round and the paper is too plain, then the painting gets inside the lines,and it´s a mess. Please help! I've done a lot of painting on glass and one the best places for a beginner is Donna Dewberry. She is a self taught artist who is credited for her techniques on double loading you brush to combine colors on all types of surfaces. There are a ton of her glass painting. Videos o line. She can tea h you to make the most beautiful glass painting possible. It's amazing how easy it is learning how to create amazing artwork that would seem impossible to even some of the best artists much less a beginner lol. She carries her own line of paints brushes everything you need to get started. I've used alot of great paints that make beautiful art on glass wood canvas and yes even walls lol. Check out her vidson YouTube and on her website. I promise you won't be disappointed and you will learn so much in short order! Most of all jump in with both feet and have A blast!!!! Happy painting y'all! I apply mosaic pieces to the outside of glass vases. I would like suggestions as to how to paint the interiors, so they are opaque and you don't see the glue. They do sell glass paint at the craft store that comes in both transparent & opaque finishes. Put some paint inside the glass & shake it till it's painted, good luck. You can also etch the outside of the vase before you apply the glue and mosaics. it will turn the vase opaque without having to use paint that might lech into the water if you use them for flowers, as well as give the glue a better hold on the glass so the mosaics don't slip. also, you can use the etchings just where you want the mosaics to go, so if you want to leave some of the vase clear, you can. You can find etching cream in almost any art/craft store, not walmart though, I tried, for around twenty dollars, and I've made several decorated mirrors, and I've used only half of the bottle. send us some pics of your vases though, they sound really pretty. 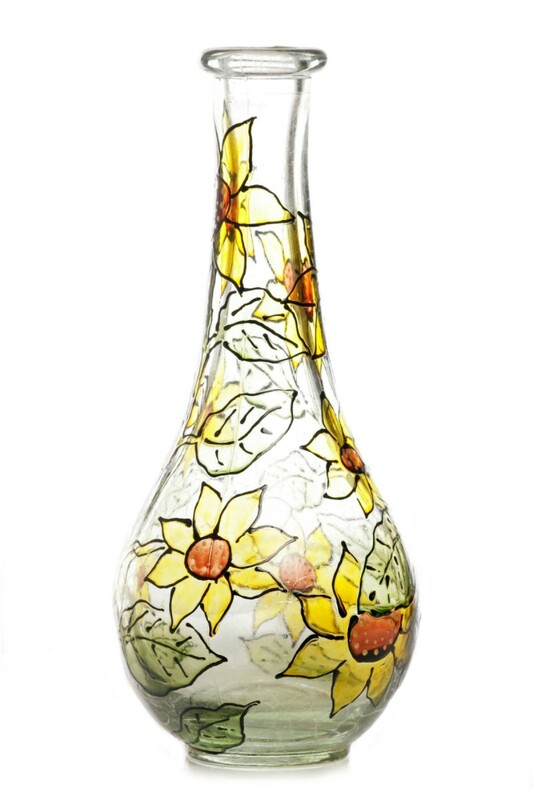 Where can I find template designs for flowers for glass painting? I'm not sure, but you might find them on MarthaStewart.com. She has glass paint out now. You can probably find the paint at Michael's. This is a project that is on my list to try. It looks like a lot of fun. Good luck with your project.